Sunday, March 10, 2019, 1–4 p.m. 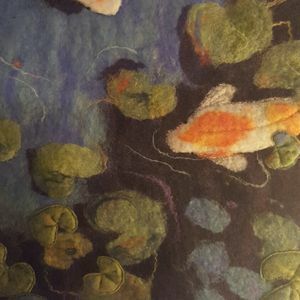 In this 2D needle felting workshop led by Laura Rankin, participants will learn to "paint" with wool. Instead of canvas or paper, students will create pictures with dyed wool batt on a 9" x 12" piece of commercial felt using basic needle felting techniques. Each student needs to bring two or three pieces of felt—any color—which can be purchased inexpensively at craft stores. Students should also bring reference photos for the wool creations they will be making—for example, a photo of a still life, a pet, a landscape, a favorite design, etc. Wool batt will be provided in a wide range of colors, and basic techniques will be demonstrated to show how to build a picture with wool. Materials and techniques, such as embroidering and beading to add dimension to the finished pieces, will also be shown. Each artist will receive written materials about the medium, simple rules of composition, and suggestions as to where to purchase more felting supplies. All materials are provided.